February is Black History Month and I have been searching for a story about African American contributions to bicycling. I found the story in my bike love: bicycle travel. In my mind, the 25th Infantry Bicycle Corps are trailblazers of bike touring. In 1866, Congress created the first peacetime all-Black Army regiments—the Buffalo Soldiers. There were four regiments in all and members of the 25th Infantry stationed at Fort Missoula became the Bicycle Corps. Bicycling caught the eye of the US military in the late 1800s. 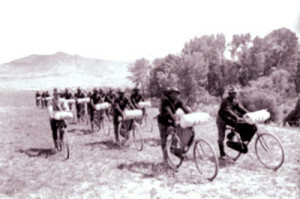 In 1896, Fort Missoula’s Lieutenant James Moss, a white officer (African American regiments were historically commanded by white officers), was granted permission to establish a Bicycle Corps with soldiers from the 25th Infantry. Their job was to test the bicycle for possible military applications. Jerry M. Certain’s parcel carriers. What resulted was a journey of epic proportions. After shakedown rides to Lake McDonald (126 miles) and Yellowstone National Park (800 miles) in 1896, the men rolled out of Fort Missoula on June 14, 1897 at 5:30 in the morning. Forty-one days and 1900 miles later, they pedaled into their destination, St. Louis. The Iron Riders — as they were dubbed — tackled the mountains, the plains and racism, in every kind of weather, without the benefit of paved roads (or any trails at all sometimes), modern route finding or the latest bicycle touring equipment and gear. Each member of the Bicycle Corps was out-fitted with a Spalding military bike, knapsack, bedroll, tent, a leather case to carry food and personal effects, a rifle and 50 rounds of ammunition. Fully loaded, each rig weighed about 76 pounds! Although the Bicycle Corps never gained military prominence and was eventually eliminated, bicycle travel remains popular today and we should recognize them as our early pioneers. In 1974, two Black Studies professors from the University of Montana and eight of their students were inspired to honor the Iron Riders by retracing their historical journey on bikes. Interest in bicycling and bicycle travel continued to grow and I’m sure it was in part to the media attention the Bicycle Corps garnered from their amazing ride. In 1899, an African American inventor by the name of Isaac Johnson filed a patent for a unique bike frame. Johnson’s frame was designed to be folded compactly for storage or transport—a bike you could take with you on a vacation! 1899 was a good year for bike-related inventions. 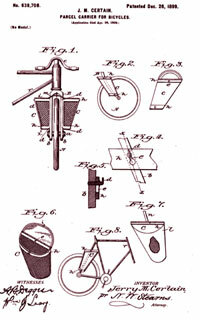 Jerry M. Certain filed a patent for “parcel carriers for bicycles” intended to be attached to the frame to carry items. Today we refer to those carriers as panniers, a necessity for bicycle travelers. And yes, Jerry Certain was an African American. There are many intersections between Black History and bike history. Another interesting one for the bicycle tourist is the Underground Railroad Bicycle Route. Developed through a partnership between Adventure Cycling Association and the University of Pittsburgh’s Center for Minority Health, the UGRR memorializes the network of clan-destine routes used by African Americans as trails to freedom before and during the Civil War. Bicycle travelers are natural explorers and there is much to explore in Black History.